Virtual reality and augmented reality are the future of gaming – this is what we keep being told. While some of my most memorable recent gaming experiences have been in VR, I’m inclined to disagree. In part because the software is mostly limited to throwaway – albeit impressive – experiences, and partly because of the faff. The amount of wires involved makes it feel like you’re bound to some hell portal by Cthulhu’s dreadlocks. Read more: the best VR games on PC. Tension VR – a Lincoln, UK-based VR centre – essentially solves this problem. You go there, you pay some money and you have an hour or two on the HTC Vive in a perfectly-sized space for room tracking. A member of staff stays with you, switching games and handling the wires – which, by the way, definitely want to kill you – trailing behind you. It’s the perfect solution, giving people a chance to try out VR before dropping the best part of a grand on some untested tech. 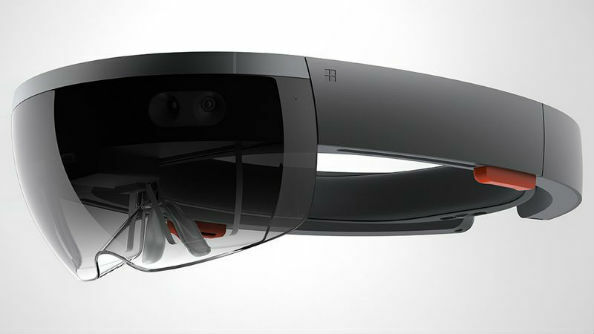 The HoloLens is a different prospect. Untethered and offering AR – with the real world still visible around you – you’re far less likely to kill yourself during use. Still, the expensive kits aren’t out in the wild just yet. Fortunately, Tension VR managed to get hold of a unit and they invited me over to try it out. And try it out I did – erm, after it finished installing a Windows 10 update on its own. First off, the kit is much nicer looking than the Rift. Sliding over your head and acting like the bulkiest pair of sunglasses in the world, it’s almost like a Star Trek prototype, clearly made for massive Klingon heads like mine. Of course, despite it being more stylish than a VR head clamp, you still feel like a giant berk using it in front of anyone. That’s because it’s controlled via gestures. You put up your index finger like you’re telling someone to stop being a numpty, then you pinch it together with your thumb for what’s essentially the left click of a mouse. To head back to the main menu, you make a gesture Microsoft call ‘bloom’, holding your palm upwards in a fist and slowly spreading out your fingers like you’re threatening to nuke someone. You can also control it with your voice, using Cortana. Partway into my session I was handed a clicker, which was much more reliable than the hand-gestures. The set was loaded with free apps, so I dived straight into Actiongram. 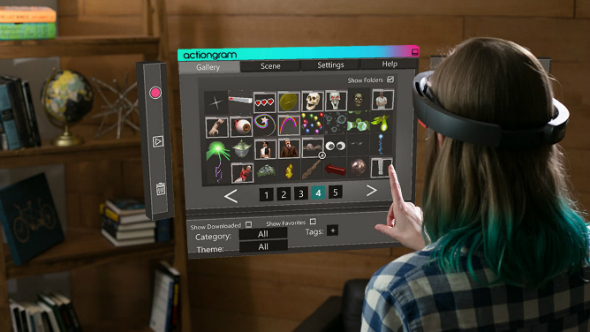 Actiongram is essentially a program in which you can make AR videos using character models that you can download and pull into your space. There are a handful of emotes for each, and you’re free to drag them around the room, resize them and make them activate a gesture. I gave Warcraft’s Ogrim a fist bump, because I’m a genius creative. If you have more time, you can easily make AR video shorts using the suite of options, however. There are a bunch of examples on the official site. Next up, I tried RoboRaid, an AR shooter that fills the room you’re in with tiny robots who want to shoot you in the face. You use either the pinch gesture or the clicker to fire back, aiming with your head movement and literally ducking out of the way of incoming shots. It’s really cool to see the robot pods crash through the actual environment, and even your missed shots leave their mark on your world. Once I was done dancing around the room shooting imaginary machines, I popped on HoloTour, a virtual tourism app. Currently it only has two locations to visit: Rome and Peru. The latter was by far the most interesting, seeing you standing atop a hill overlooking a valley where an ancient Incan battle took place. You’re filled in on the history of the land as you look around, with the narrator talking you through the Incan weaponry and even showing you how they defeated a larger attacking force: by flooding the valley with a destroyed dam. The final app I tried was called Fragments. This was easily the most promising of the bunch. 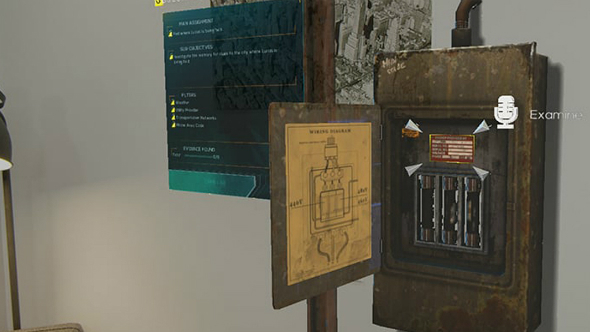 In it, you dive into memories pertaining to the case of a kidnapped child, looking around the environment for clues: train tickets, fuse box manufacturers, and any other clutter that might give you an indicator of the location. At any time, you can use the voice command “crime lab” and you are taken back to a room where you can piece the evidence together. You’re presented with a holographic map and you can use it to try and narrow down the location of the crime scene based on the evidence. You best bring a notepad for this one. 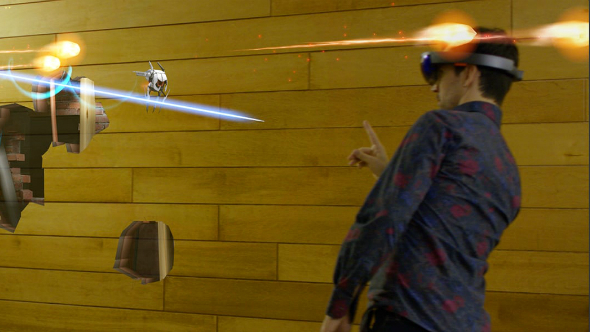 There’s certainly some potential with HoloLens. Fragments proves that the device can create interesting gaming experiences that just wouldn’t work as a traditional game. The way the device uses its speakers to direct its sound into your ears without bothering people nearby also feels like a real advancement. Unfortunately, the viewing area does drag the device down somewhat. Other than a small rectangle in the centre of the set, you can’t see the AR world. It’s like having a tiny window into another place where massive Warcraft characters exist, while your periphery is just seeing reality. When looking at characters in particular, it’s jarring because you can only see half of them at a time. If you’re looking someone in the face, their legs just won’t be visible in your periphery at all, and it does take you out of the moment. Personally, I would hold off picking one up until there’s plenty more software on offer. What’s there is promising, but I felt like I had seen it all by the time I left Tension VR. Again, this just proves how important these places can be. You wouldn’t buy a car without taking it for a test drive, would you? Head over to the official Tension VR site if you want to book and try it for yourself.